Lance Li clicks through an endless, uniform sea of purple, pink, and yellow rectangles. He stops and zooms in on a narrow section that’s glowing white. “This hot spot tells us that part of the panel is not performing correctly,” he says. The 2017 Kellogg School of Management graduate is looking at thermal images of a solar site in Nevada taken with a camera mounted on a drone, hovering 200 feet in the air. He zooms back out and confirms that his algorithm found and diagnosed the problem effectively. As the CEO of Aerospec Technologies, a drone inspection and analytics company, Li has set out to make operating a solar farm more efficient, safer, and ultimately, more predictable. Images of solar panels taken with an infrared thermal-imaging camera. White hot spots mark damaged cells that need replacement. Ultimately, Li knows the real cost savings come from predicting outages and maintenance needs before they even happen, and with each new data set he feeds into his algorithm, he’s training it to do just that. If the inspection is timed just right, crews can repair deteriorating panels during an annual visit before future problems arise. Li estimates that Aerospec's predictive algorithm could generate an additional $336 million for the solar and wind industries, and power 800,000 more homes with renewable energy, annually. The technology also makes maintenance work safer for crews, who tread around high-voltage electric lines that line the ground at a solar site. Safety was a main reason he chose to start the company. In 2010, Li was working as an energy consultant when he heard that eleven workers died at the Deepwater Horizon drilling rig. “I kept thinking, if we can keep our people out of harm’s way and send robots to do the most dangerous jobs, why aren’t we doing that?” says Li. When he started his MBA at Kellogg, Li knew he had the unique opportunity and the right resources to make an impact in this space, but he didn’t know exactly how his idea would manifest. “I tried building drones and selling them, I tried selling drones as a middleman, and I tried providing drones as a service,” he says. It wasn’t until he enrolled in a Kellogg entrepreneurship course called New Venture Launch that Li solidified his business model and began to build the foundation for Aerospec Technologies. Ready to test his idea, he applied to Northwestern’s flagship business plan competition, VentureCat, where he won the energy category and $5000 in seed funding. 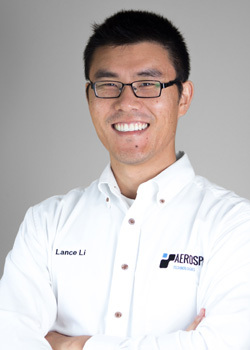 Building on that momentum, Li linked up with leaders at the campus incubator, The Garage, and secured the physical space where he could focus on Aerospec’s day-to-day operations. He hired Northwestern interns studying artificial intelligence and machine learning, and began to pitch to clients. Going up against the largest player in the industrial analytics space, General Electric’s Predix platform, Aerospec stands out in the areas of data collection and industry specialization. By continuously collecting data from its solar clients, Aerospec trains its intelligent algorithm to develop and recommend best practices for the entire solar industry. Called prescriptive analytics, the method uses tools from artificial intelligence to prescribe solutions to possible scenarios – in this case, panel malfunctions. What it means is that Li will not only be able to detect what might go wrong, but he will also be able to tell a site operator what needs to be done to prevent problems ahead of time. As many of Aerospec’s clients also own wind farms, Aerospec is looking to extend its services to the wind industry soon. As the company grows, Li hopes to raise the bar for how drones can be useful in developing solutions to a variety of common problems.